Yes, I have a "compost bin" list on this site that I take the time to update. I really do feel bad when we don't get through the food we purchase. I know us humans are not caring for the soil as well as we should and easily can. I support organic gardening and care that the food we eat is as nutrient rich as possible. I understand that compost is a simple way give back. I hate piles of "stuff" which translates into frustration with all the waste we have to make room for in our cities. It strikes me as odd that there are office "parks" in Silicon Valley a built on landfills. No, we don't compost. Sadly we have a huge garbage can that we put by the street every Monday night for pickup and transportation to a landfill -- er -- future office "park". Even sadder still, we have a compost bin. Composting is just finely tuned decomposition, which is a natural part of life and always has been. 25% of the waste that goes to landfill is compostable. "Passive" composting happens with absolutely no involvement from humans, but can take a long time. 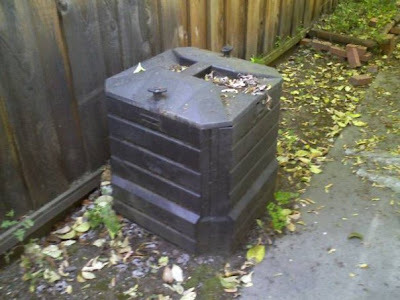 "Active" composting can take place in as little as two weeks. Several factors influence composting, including sun light, aeration and the mix of carbon and nitrogen rich items added to the pile. I have tried to compost on several occasions before without success. Where did I go wrong? Honestly, after about 15 minutes of research this go around, I remembered why I don't actively compost: it takes time. Time to learn, time to manage, time to deal with the end product. The ratio of carbon to nitrogen should be 30:1. Sources of carbon rich material include leaves, pine needles, etc . Sources of nitrogen rich materials include grass clippings, manure, and blood meal. What about kitchen waste? I tried to find a simple list of carbon sources and nitrogen sources, but 10 minutes of browsing left me empty handed. Surface area amounts to the need for exposure to air. We don't have space for a large flat pile. That lead us to the use of bins, which need to be placed in a warm area and regularly turned. An appealing option is a rotating drum, but size and placement are factors there. Aeration is about, well, exposure to air. Again, we don't have space for a large flat pile and are unlikely to get out the pitch fork and turn a small, contained pile. Moisture is needed to ensure the microorganisms involved can absorb the molecules. Moisture needs to be between 40 and 60%. Dry piles don't work, neither do soggy piles. I have tried "watering" compost piles in the past but simply have no idea how to easily judge percent moisture. Temperature maximizes the efficiency of decomposition. Too cool, and things go slowly; too hot, and the microorganisms go to the great compost pile in the sky. Ideally the temperature ranges from 90F to 140F -- again, how to effectively measure and manage this? Turning, watering, balancing the carbon to nitrogen ratio. I travel regularly and when I'm home I know I won't devote that time to managing our compost pile. Sean is just not into this type of thing. We don't need compost. Yes, the world needs less waste and the earth's soil needs replenishing, but Sean and I don't garden -- even passively. Our yard just is. We have trees and a very small area of grass. I don't know what we'd do with the compost even if we were successful in producing it. I thought I had the answer -- a compost bucket under the sink that we add to the "yard waste" bin our sanitation company picks up each week. However, I'm very disappointed to find that as progressive as California is, our recycling service provider does not accept food scraps, including fruits and vegetables.